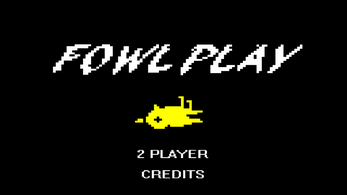 Fowl Play is a game that was produced by Anna Marie LeBlanc, Bjarmi Bergsteinsson, Dylan Humber, Emmerson Ryan, and Sophie Twardus at the Halifax FaxJam 2018. Given the prompt of "Fight or Flight", we decided to make a bird-fighting arcade-style game with inspirations from classics such as Joust. Fowl Play is a 1 vs 1 competitive arcade brawler. Each player controls a bird, flying and dashing around the screen. The first player to bring their opponents health to zero is the winner. Fowl Play placed third place out of thirteen contestants. Each player must use a controller/gamepad to control their bird. Fly - To control your bird and fly around the screen, hold the left joystick in the direction you want to go, and mash the A button to flap your wings. Dash - Use either of the bumpers to dash in the direction the left joystick is pointing. Dashing into your opponent will damage them. Dashing can also be used to fly through walls/platforms, if timed correctly. Grab - While positioned directly on top of your opponent, use the right trigger to grab them. You can then carry them around the screen. Your oppponent will remain grappled until you release the trigger, or they dash away. Menus - Use the left joystick and the A button to navigate menus. The Hedgehog - Tonic the Hedgehog (any relation to hedgehogs living/dead/fictional is purely coincidental) will run back and forth along the length of one of the platforms. Touching him will damage your bird. Arenas - The arena that the fight takes place in is procedurally generated. Each arena has three platforms, one wall, a hedgehog, and one of each of the power ups. Each of the birds will spawn on separate platforms, as will the hedgehog.